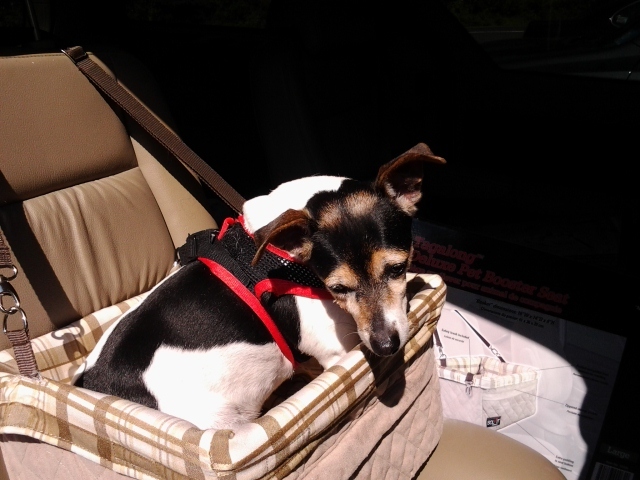 Did you know....state law....put your dog in a car seat! Have you heard the latest buzz about drivers needing to use car seats and carriers for your dogs and cats? Nope, it's not a rumor, Garden State drivers who fail to buckle up their dog or place their cat in a carrier could face criminal charges as well as fines totaling up to $1,000, according to the New Jersey Motor Vehicle Commission. "You should not be driving down the road under any circumstances with a dog driving the car, said Elyse Coffey, a spokesperson for the New Jersey MVC." We don't want dogs driving with the steering wheel and we don't want cats who sit on the dashboard." In an effort to make sure drivers are compliant State officials are teaming up with the NJ Society for the Prevention of Cruelty to Animals to enforce laws requiring motorists to "properly restrain their pets." It goes on to further state that the law forbids dogs from hanging out windows and also from riding in the bed of a pickup truck. Drivers who fail to do so could face fines from $250 to $1,000 for each offense. They could also be charged with disorderly conduct under New Jersey's animal cruelty statutes. There are many forms of pet restraints available for vehicles so there is a wide variety to choose from. Look on the internet as there are many sources available to purchase these items from. None of them seem to be too constraining and the point is simple....they simply prevent the animal from becoming a projectile should there be a horrible accident. So buckle up your kids and your pets with the same love and continue on your way! Part of the article is courtesy of Fox News.